Join dozens of adventurers, anthropologists, artists, shamans, scientists and poets on a journey to remote regions of the Amazon and to the far reaches of the human psyche. 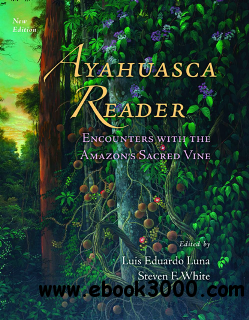 The new, expanded edition of Ayahuasca Reader shares many distinct voices of the global ayahuasca movement: researchers conducting clinical studies on its healing effects, painters depicting the ineffable experience with visionary images, indigenous people carrying the wisdom of ancestral traditions, and the stories of how ayahuasca has opened these individuals to their connection with the natural world and their true selves. The Ayahuasca Reader is a five-part anthology which shares myths passed down over generations of Amazonian healers, personal testimonies of encounters with Amazonian cultures, a selection of hymns and texts from the religions using ayahuasca as a sacrament, writings from well-known figures in the literary world on the lasting influence of their experience, and a section of transcendental visionary color art to illuminate our understanding of ayahuasca. This comprehensive collection of writings has been expanded and updated, with a new section of ayahuasca inspired art and other resources to draw readers even deeper into the mythic mysteries of the Amazonian brew that has been gaining attention around the world. The texts chosen for this book contain translations from nearly a dozen languages, representing the voices of many different Amazonian peoples and the diversity of their cultural approaches to working with ayahuasca. The contributors also include legendary scholars of Amazonian plant medicine such as Wade Davis, Dennis McKenna, and Richard Spruce; cultural icons like Allen Ginsberg and Alex Grey; and recognized shamans and spiritual leaders such as Raimundo Irineu Serra, Fernando Payaguaje, and Alberto Prohano. This new edition also includes essays from prominent visionary figures including Graham Hancock, Jan Kounen, Jeremy Narby, Susana Bustos and others.